Last week we broke Adwords Quality Score into three parts and looked at the importance of ad relevance. This week we’re exploring expected CTR and what it means for your Adwords campaigns. Google quality scores look at expected Click Through Rate (eCTR) but it’s important to understand CTR first. Click through rate is a ratio that gives you a good sense of whether or not your ad appeals to users. It divides the number of clicks by the number of impressions. Each ad gets its own score so you can determine which ads in a campaign are most successful. CTR is a great way to gain information about your ad campaigns. High CTR means that users find your ads helpful and relevant. The cool thing about CTR is that it is reflected as a percentage so you don’t have to do much guess work. A high CTR means that of the people seeing your ad (whether 100 or 1,000,000), a good amount of them are clicking on it. And that’s the goal. Use it as a diagnostic tool. You can get a great snapshot of campaign success but simply looking at CTR. 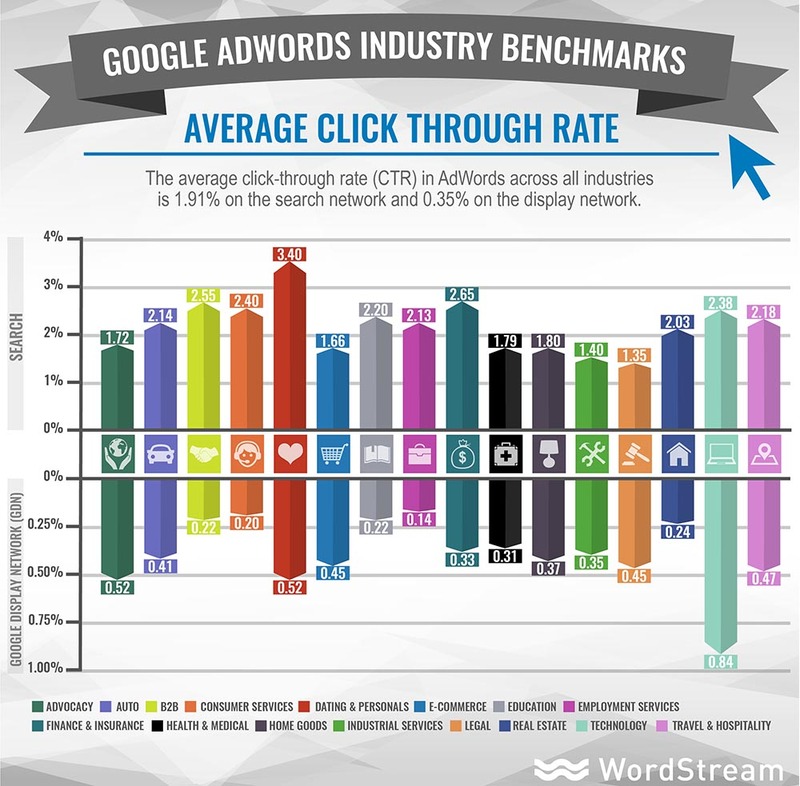 The average CTR for Adwords is 2%. Seem low? Anything about 2% is performing better than average, so that’s your sweet spot. Keywords and ads performing lower than this you’ll want to target for a refresh. Always look at those ads performing well to see if it’s an easy fix. What’s an Expected Click Through Rate and Why Does It Matter? When it comes to Google Quality Score, it’s not about CTR but the expected CTR (eCTR). Google predicts whether the keyword you’re targeting is likely to be clicked when shown for that keyword, without taking into account the position of the ad, extensions or other ad formats that may affect the visibility of your ads (Google). Basically: is your keyword likely to get a click on your ad? The expected click through rate changes. Adwords adjusts it when a search term triggers your ad by looking at search terms, the device being used and other factors. Average and Above Average: no problems with the keyword’s expected click through rate when compared to all other keywords across Adwords. Below Average: Chances are your ad text doesn’t appear relevant to the keyword. This is always a signal to assess your ad copy and make sure it matches the intent behind a search on that keyword. If you’ve got “below average” as the status for one or more keywords it’s time to up your game. Here’s six ways how to do just that. Look at your ad text. Is it relevant? Is it creative? Does it attract people who will interact with your site? It’s easy to throw in a pitch that will attract people, but will they stay? If you’re selling gluten free baked goods and use the keyword “free cookies with purchase” you’ll likely get a lot of clicks. But if those shoppers aren’t gluten free they might not be interested in your cookies and quickly bounce off your site. Getting people to your page is important but getting conversions is more important. Make sure you’re attracting the right clicks. Stand out from the crowd. It’s not a lot of space so don’t waste it telling people that you walk dogs. Instead, highlight something that sets your dog walking service apart. Like that all of your dog walkers are in vet school or work as vet techs. Are your scarves not only hand knitted but hand knitted from llama wool you sheer from your pet llamas? Put that in your ad! A/B Test. It can be easy to simply throw any text into an ad but it’s important to experiment, especially with calls to action. Last week we talked about this a bit but it’s important to reiterate: some words resonate with users more than others so play around with your CTA to see if you’re attracting more relevant clicks when changing up your language. Get specific. Language again! If you’re in a saturated market, make sure that you get specific in your ad text so that you attract more users. If your ad looks like the one above it, it’s not getting clicked. Don’t operate in a vacuum. The best research you can do is looking at your competitors and learning what they are targeting and how it’s working for them. Your quality scores and CTR are two parts of a larger puzzle. Use them not as the end all and be all but as part of an overall strategy. Remember there are a lot of other factors that come into play with your digital marketing campaigns. The chart below shows average CTR for various industries. The 2% average is just that: an average. If you’re running a dating service or selling books on relationships, for example, you’re going to want to aim a little higher for your CTR since the average in that industry is 3.4%. In the legal field? 2% is .65% above average. Take some time to check out your CTR and expected CTR and note where you could use some improvement. Want help? Contact the PPC experts at Digital Firefly Marketing for a free Pay Per Click audit.